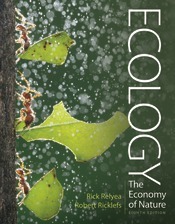 Ecology: The Economy of Nature teaches ecology through an evolutionary perspective, and with an emphasis on the quantitative skills needed to fully understand the field. The 8th edition continues that mission with updated pedagogy in the text, and powerful new quantitative problem solving tools in SaplingPlus. This landmark text helped to define introductory ecology courses for over four decades. The 8th edition maintains its signature evolutionary perspective and emphasis on the quantitative aspects of the field, but it has been improved for today’s undergraduates -- with extensive new pedagogy, including Learning Goals, Concept Checks, fresh examples and fully integrated media resources. Students will especially appreciate the new video tutorials that accompany the Analyzing Ecology essays. The 8th edition also introduces SaplingPlus, an online system which combines the powerful multimedia resources for Ecology with an integrated eBook and the robust assessment library, creating an extraordinary new learning resource for students. This landmark text helped to define introductory ecology courses for over four decades. The text maintains its signature evolutionary perspective and emphasis on the quantitative aspects of the field, but it has been improved for today’s undergraduates—with extensive new pedagogy, including Learning Goals, Concept Checks, fresh examples and fully integrated media resources. Students will especially appreciate the new video tutorials that accompany the Analyzing Ecology essays.